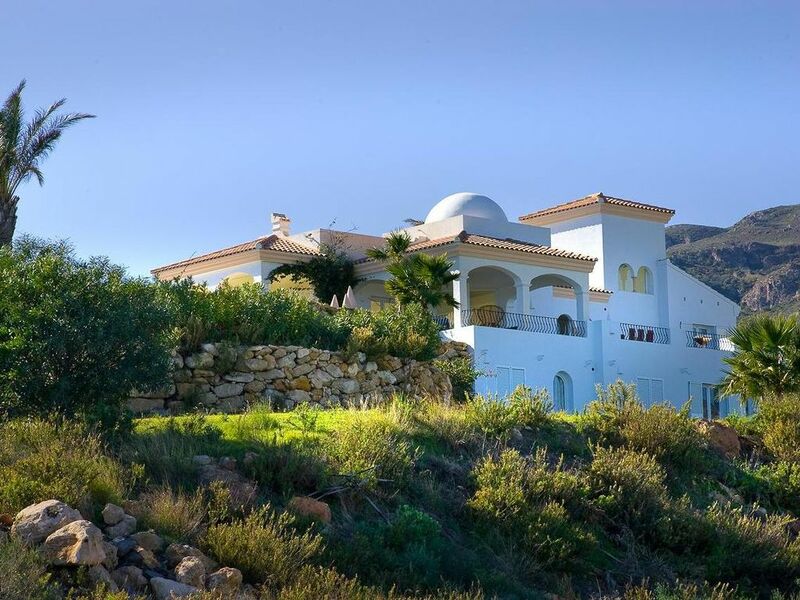 This fabulous villa is situated in the ancient Moorish village of Mojacar on the coast of Almeria. It occupies sole position on the top of a small mountain commanding breathtaking views along the coast as far as Cartegena. Surrounded by acres of mountains on all sides there is no-one to disturb the peace, but only 5 minutes away you will find the beautiful beaches, restaurants and shops along the beach road below. This is still a relatively undiscovered coastal area so the miles of nearby beaches never have more than a scattering of bodies. Other attractions include the beautiful villages of Mojacar and Bedar with their narrow cobbled streets and Arabic architecture, the tiny coastal and fishing villages of the Cabo de Gata National Park, several Golf courses including the championships courses of Valle del Este and Desert Springs, tennis, riding, all water-sports and the marina at Garrucha. Unspoilt beaches: Almeria is still a relatively undiscovered area of Spain and as a result the miles of beaches never receive more than a scattering of bodies, and if you want to jump in the car or boat you will find private coves all along the coast. Almeria receives more than 300 days of sun a year so good weather is more likely than not outside of January and February. Excellent restaurants: Mojacar and the surrounding villages are full of good quality restaurants and bars. You can dine along the beach front overlooking the Mediterranean or drive up into the mountains to find quiet and exclusive retreats where good food and wine is always on offer. From Garrucha prawns to succulent pork you will find a wealth of dning experiences on offer. Historic villages and natural beauty: Around Mojacar are many white washed villages nestling in the mountains, most of which were built by the Moors. There are also many fishing villages along the coast where excellent fish and seafood are to be had. All bathrooms have sea views with the exception of the Pink bathroom which overlooks a sunken garden. Mojacar Village is famous for its ancient Spanish streets, houses, spectacular views and fiestas. The pool measures 10m by 5m and has an infinity edge. It can be heated in Winter at additional cost but it is very expensive due to its large size and position on the mountain edge. The spacious and stylish interiors are decorated with white walls and light yellow marble floors throughout. Every room is designed to enjoy the amazing views, with large windows and glass doors the light floods every corner of the property. The decoration is modern and uncluttered with light furnishings and large pictures. All bathrooms are tiled throughout with marble sink surrounds and chrome fittings. Apart from the large indoor living area the house is surrounded by terraces and gardens. These are also furnished with sofas and dining furniture in both shaded and sunny areas. The swimming pool is spectacular, surrounded by plants and seeming to join with the sea due to its lipless edge. Please note that the villa is not suitable for young children unless under close supervision due to the drops around the gardens. However children are very welcome and many have stayed without any problems. Mojacar is an ancient Moorish village set in the hills of the Sierra Cabrera mountain range. It is just 50 mins from Almeria airport and 2hrs from Alicante or Murcia Airports. Ski: Europe's southern-most ski resort Sierra Nevada (Granada) is only 2 hours 30 minutes drive away.